The last stop before the system’s edge, the Ring Worlds are the new frontier in Solar colonization. Here you’ll find a host of terraforming colonies on Titan, Enceladus, and Dione, along with the greatest energy resource beyond the asteroid belt – the Rings of Saturn. Nestled among the rings themselves, the Kronos Mining installations drill for the valuable helium-3 locked away within the ice. On Kronos II, Captain Olivia Rhodes is about to make history by handing her operation over to her second-in-command: Jack, a fully adaptive, Echo Unit android. But space doesn’t always cooperate. And a mission’s not over until your boots are back on solid ground. 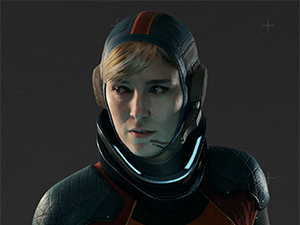 The child of a Terran botanist and astrophysicist, Liv is both a brilliant scientist and a first-generation spacer. Both parents were part of the Solar Colonial Initiative – a joint, civilian-military organization aimed at establishing permanent settlements throughout the system. Her father helped establish the first terraforming station over Titan, Saturn’s largest moon. Graduated top of her class in the Solar Aerospace Academy, excelling in verticals ranging from engineering and geology to robotics and salvage. Recruited by the Atlas Initiative, an organization dedicated to bringing automated systems to dangerous outer planets environments. One of the youngest astronauts ever to earn a command post, and one of the first pioneers enrolled in the Echo Program, which paired her with a fully self-aware android partner. Designed by Atlas Intelligence to serve as both crew and companion, Jack’s creators endowed him with a suite of AI protocols designed to service two extremely ambitious goals. First, to provide a durable, versatile assistant that could handle the challenges faced by long-range explorers. And second, to shepherd the physical and emotional well-being of a human partner on a long-term, space flight mission. Although all Echo units are programmed to bond with a long-term partner, Jack’s relationship with Liv has been uniquely well developed. His personality matrix has grown more advanced, and he possesses a rudimentary understanding of concepts such as humor, irony, comedic timing, and innuendo. It’s these emerging human attributes that prompted Atlas to move forward with the next phase of testing – shifting the Kronos Stations over to fully unmanned operations run by Echo unit foremen. The Habitation ERrand Administrator (HERA) is the primary operating system for all Atlas Corporation vessels, orbital facilities and planetary installations. Since her original inception in the late 2070’s, Hera has easily become one of the most widely utilized Artificial Intelligence constructs in the solar system. 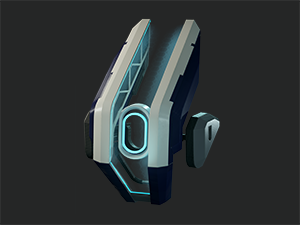 Aboard the Kronos II, Hera’s primary function is to assist Jack and Liv in managing the day-to-day operations of the mining facility, providing situational analysis, data retrieval and risk assessment. 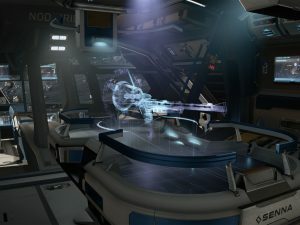 Her presence is ubiquitous across the entire Kronos II Orbital Data Network, allowing her to communicate directly with both Jack and Liv regardless of where they are in the mining facility. 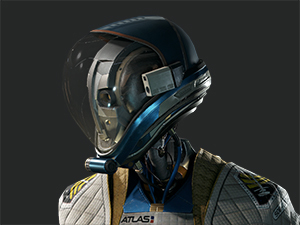 Experience the sporting sensation of the future, as the most advanced line of Atlas androids go head-to-head in a test of skill, cunning, and zero-G agility. Grab the disc and face off against the enemy squad in this fast-paced arena battle. May the best bots win! 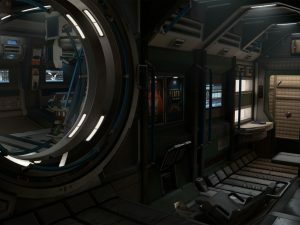 Kronos II’s central concourse is a multipurpose passageway connecting the Command Deck to the Cargo Bay, Bioregenerative System, and the EVA Staging Area. 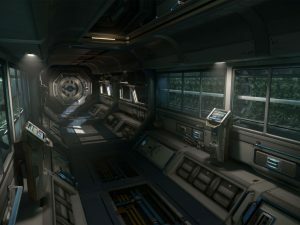 The Kronos II Captain’s quarters feature a sleeping area, personal workstation, and a resistance trainer for cardiovascular conditioning and to help prevent muscle atrophy. Here on the bridge of Kronos II, Liv and Jack control every aspect of day-to-day mining operations, from remote dig sites to industrial processing plants. The Kronos II Oxygen Garden runs on an advanced bioregenerative ecosystem utilizing managed LED growth lamps and genetically modified foliage. 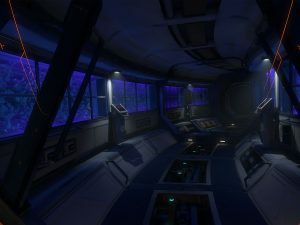 Explore sprawling industrial complexes and deep-space mining platforms, as you investigate a mysterious spatial anomaly. © 2019 Ready At Dawn Studios. 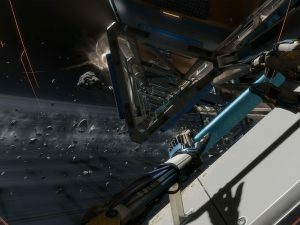 Lone Echo is a trademark of Ready At Dawn Studios LLC in the U.S. and/or other countries.